There are a number of new medications to treat PPHN that are being reviewed. One example is sildenafil, which is used to treat erectile dysfunction . Small studies have shown positive results with sildenafil. However, larger studies are needed to confirm the benefits and safety of the medication. Extracorporeal membrane oxygenation. Cincinnati Children's Hospital website. Available at: http://www.cincinnatichildrens.org/health/e/ecmo. Updated May 2015. Accessed September 25, 2017. 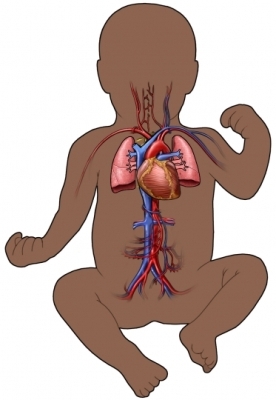 Persistent pulmonary hypertension of the newborn (PPHN). EBSCO DynaMed Plus website. Available at: http://www.dynamed.com/topics/dmp~AN~T114578/Persistent-pulmonary-hypertension-of-the-newborn-PPHN . Updated March 28, 2017. Accessed September 25, 2017.